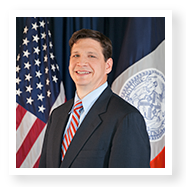 As Director of Energy Regulatory Affairs for NYC Anthony is responsible for acting as the primary energy policy advocate for the City of New York before numerous State and federal agencies, and providing analysis in a wide range of regulatory and legislative matters related to energy. Anthony is responsible for the development of energy supply and transportation sector action plans as part of a comprehensive Climate Action Plan that will also include initiatives in the building and solid waste sectors. Prior to joining the Mayor’s Office Anthony was the Director of the NYC Department of Environmental Protection’s Energy Office with overall responsibility for setting the strategic energy goals for the agency, the development of metrics and quality assurance programs for tracking consumption and energy costs, and the management of the capital priorities for energy projects. Anthony has led development efforts for hydroelectric projects; the investigation of wind and solar opportunities; and beneficial use of anaerobic digester gas. Anthony holds a Master’s in Public Health from Columbia University and a Bachelor’s of Science degree from Binghamton University.